Leaders of South Africa’s ruling party asked the Institute for Security Studies (ISS) for a substantive input on tackling crime and corruption as they prepare for the crucial 2019 national elections. After nearly 25 years in power, the African National Congress (ANC) knows it urgently needs to address voter frustration with endemic crime and violence. As part of the ANC’s pre-election policy consultation, Minister in the Presidency Jeff Radebe invited the ISS to address the party’s manifesto conference of more than 600 national and provincial ANC leaders, government officials, academics and civil society. The consultation was opened by President Cyril Ramaphosa who told party members they could no longer count on ANC liberation credentials to secure votes. 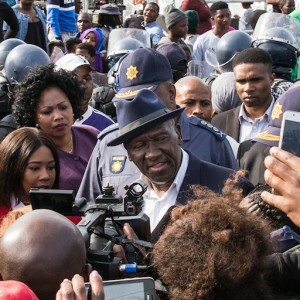 Instead the ruling party needed to urgently address South African’s real concerns, such as security and corruption, he said. The ISS sent a senior team, including chair of the ISS Board of Trustees and head of African Futures and Innovation Jakkie Cilliers, and ISS justice and violence prevention head Gareth Newham. In his lead presentation Newham provided evidence for the priorities required to strengthen criminal justice, anti-corruption and violence prevention. This prompted a dynamic five-hour debate among senior government and party figures, including ministers of justice and home affairs, ANC election chiefs, parliamentary portfolio committee chairs, provincial ministers and the directors general of correctional services and home affairs. Newham explained the causes of poor police performance, and how police could quite quickly build accountability and public trust. Improving police conduct was as important as strengthening their crime combating capabilities, he told delegates. The organiser of the conference’s crime and corruption commission praised ISS inputs for being high quality and for stimulating ‘vibrant and substantive’ discussions. ‘We were recognised by the ANC at the highest level for our impartial and evidence-based analysis and advice,’ Newham said. The ISS argued robustly against policy suggestions not supported by evidence, and didn’t shy away from politically sensitive issues. Noting the serial crisis in police leadership, Newham said only the wholesale rejuvenation of police top management would improve its effectiveness and public reputation. The ANC was urged to support the creation of a dedicated and independent investigative and prosecutorial capacity to tackle corruption. Newham told the ruling party and government officials that the most powerful perpetrators needed to be held accountable as a starting point for any anti-corruption strategy. The ISS contribution drew a very positive response. ANC leaders said they would seek further ISS policy advice to promote public safety necessary for achieving a prosperous society.